I know the first thing you are going to say to me – where is the apple in this recipe?There is no apple in this recipe. I suppose I could sneak some in somewhere …. but apple for the sake of apple even if it doesn’t go? Hmmm, perhaps not. The recipe I am sharing is one I have created for my monthly food page in our local paper, The Gisborne Herald. It is a simple salad full of crunch and flavour. The tzatziki is one of my favourite spreads. I need leftovers to smear on wholegrain toast and it is for this reason the recipe makes more that you really need for the salad. And when I say smear, I actually mean plaster. The thicker the better. Add a couple of slices of supremely ripe tomatoes, a sprinkling of salt and pepper and lunch is served. To drain the yoghurt, place a clean cheesecloth inside a sieve and set over a bowl. Pour in yoghurt, cover loosely and leave (at room temperature) to drain overnight. Alternatively, use 200g thick Greek yoghurt and omit the draining process. Combine the drained yoghurt, sour cream, cucumber, garlic and mint leaves. Stir in olive oil then season to taste. Cover and refrigerate until required. The tzatziki can be made a few days in advance. Place couscous and boiling water in a glass bowl and set aside to plump up. Deseed capsicums and dice, deseed chilli and remove membranes. Finely chop the chilli flesh. Slice spring onions, quarter and slice the cucumber (peel if you prefer but it isn’t necessary). Halve cherry tomatoes and pit the olives. Mash or crumble the feta; drain and rinse the chickpeas. Combine all the prepared ingredients, including the couscous which will now have soaked up all the water. Stir through sufficient extra virgin olive oil to lubricate the salad without drowning it. Add the lemon zest, extra mint leaves and season to taste. Set aside for the flavours to absorb and combine while the lamb is cooking. Allow 120 – 150g lamb fillet or 3-4 cutlets per person. Bring lamb up to room temperature. Rub with a little olive oil then season. Place the fillets on a rack over a tray or dish to catch the drips and place under the oven grill (at 180ºC) for 3-5 minutes per side or until cooked to your liking. Alternatively the fillets can be BBQ’d or pan-fried. Remove from heat, cover and rest for 10 minutes. If using a lamb rack, sear all over in a frying pan then place in the oven to finish cooking – about 20-30 minutes (at 180ºC) depending on the size of the rack. Slice each loin into 5-6 pieces, or cut the rack into portions of 3-4 cutlets. Serve on top of a good portion of couscous salad with a generous dollop of tzatziki on the side. Serves 6. 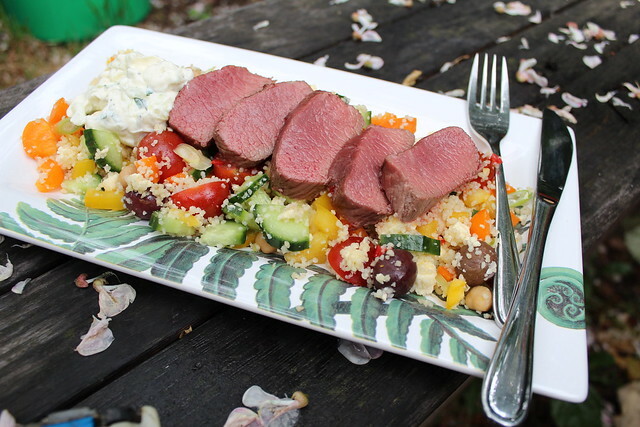 This entry was posted in Mains, Seasonal, Spring and tagged Couscous, Lamb, Salad, Savour, spring, Tzatziki by Jo Dohrman. Bookmark the permalink.